Thinking about throwing a mid week luncheon or a staff party, to help fortify, motivate, strengthen and enhance workplace relations? Or merely just looking to celebrate the end of the year with a Christmas party? Our DJ’s are available for one hour all the way up to 24 hours. Presenting a slide show for the board room and need some equipment? Our projectors, screens , lapel microphones, and sound systems are available for rent for all your office needs , any day of the week. We are fully committed to providing your company with a service that can meet if not exceed, your expectations. 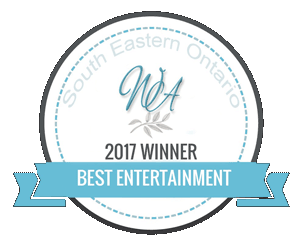 Our mission is to provide high quality professional entertainment to a conscious client who deserves only the very best. Your your total satisfaction is of upmost importance to us. We have had the privilege to work with some amazing corporate liaisons. Some of those include but are not limited to RMC, KPMG, Sunlife, KGH, Hotel Dieu, City Of Kingston, QUEENS, ST. Lawrence, KFLA, YGK Beerfest, Kingston Thousand Island Cruise Lines, Carstar, Corus Entertainment, Goodyear, Shopify, CFB Kingston, CFB Trenton, and many more. We hope to one day add your business to our list of satisfied clients.